Talk Show host, Larry King, wrote a book called Powerful Prayers. King is not a believer, He admits in the introduction of the book that he’s agnostic, (he doesn’t know if there’s a God or not) but over the years he has interviewed so many people that is overwhelmed that prayer is an important part of their lives. Every poll taken says that people pray regularly. It’s a universal fact that people everywhere pray. Not just Christians, even 17% of all Atheists pray! Larry King says that if he were to pray, he did not know who or what to pray to. He sought out a Jewish Rabbi, one of the things that he wanted his rabbi to show him: how to pray? Once in the New Testament in the book a Luke 11 the disciples asked their Rabbi, The Lord Jesus Christ the same question! If I told you that you were going to have the opportunity to talk with Jesus Christ for fifteen minutes this afternoon and you could make one request of Him, what would your request be? If you could ask Him anything, would you ask for protection? a new job? money? What would you ask for? When the disciples got this opportunity, Luke 11 tells us they had a request. “Lord, teach us to pray.” Why, of all the things they could have asked Jesus, why did they ask that question? I think it was because they saw the results of prayer in His life. They saw Him pray and they saw what happened. It’s interesting that the disciples watched Jesus preach the greatest sermons ever, they watched Him do miracles, heal the sick, raise the dead and all kinds of things, but never once did they say, “Lord, teach us to preach” or “Lord, teach us to do miracles” or “Lord, teach us to raise the dead”. Instead they said, “Teach us how to pray.” They saw that was the life support system of Jesus Christ. They recognized that was the key to His life. There is nothing more vital to your Christian life than prayer. 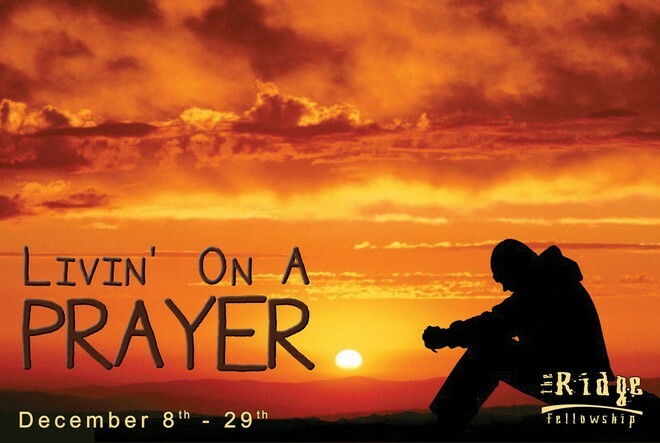 We’re beginning a new series called “Livin on Prayer.” There are a lot of faulty misconceptions about prayer. There are lots of opinions on how prayer works, why we pray, when to pray and how to pray. We’ll look at each these in this series. Also we’ll examine how God answer prayers and what if the answer is no? In addition we’ll hear some great stories and testimonies about prayer. I hope you can join us for Livin’ on a Prayer! This entry was posted in Livin on a Prayer. Bookmark the permalink.